Well, I'm up in Seattle for my 3 to 4 week January visit. And I had my favorite windows 7 laptop with me, which broke and I will able to get fixed for a few hundred pesos once I get back and a smaller Windows 10 tablet laptop. I went to a Windows store today and took a class on Windows 10. I talked to several of the staff and asked them what kind of internet speed they had at the Windows store and no one knew. It wasn't important. I guess the world is different up here. And the speeds are so fast, no one thinks about it. What a world. Maybe if you were to be paying higher prices for gas in Mexico, they could afford the Internet infrastructure improvements that you so desire for higher speeds? I question this "need for speed" for the average Internet user? It seems to be an "I want" issue so that I can brag about it. We had 50 mbps service through cable but got fed up with repeated price increases in spite of a price guarantee. So we chose a different route and dropped to "up to 20mbps service". With the exception of uploading large photo files, we don't even notice the difference in speed. I hear where you are coming from Neil. I was supposed to get 100 up by 100 down which they can't provide me, so they dropped the price. 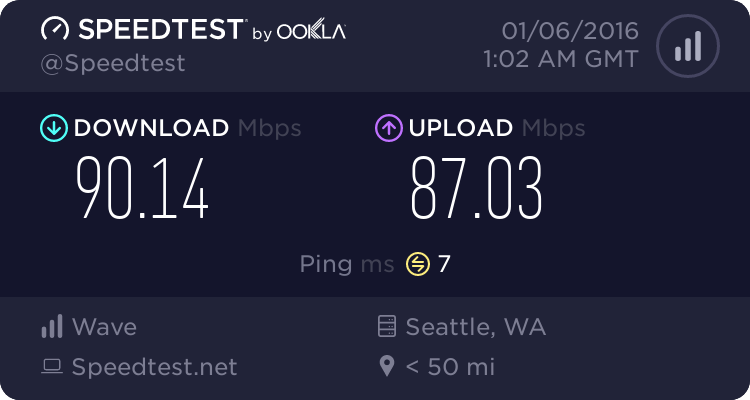 The internet is so economical up here in Amazon/Microsoft land that we don't even think of the speeds. I just know that the cost is less than $20 US per month here. Well, it's the 15th and I have been using the new Microsoft Surface book which is a 13.5 inch tablet and/or laptop since the 4th. It's been Windows 10 the whole time. Yes I did take one 45 minute class at the Microsoft Store and yes I did by a book on Amazon called "Windows 10 for Seniors". So far I haven't needed the book, but it will come in handy as I learn how to do more fun things on this new machine. And note two more suggestions at the bottom: used Firefox or Chrome instead of Edge, and VLC instead of Windoze Media Player. There was one last suggestion and that was to replace Windows 10 with Ubuntu. It took me long enough to get used to Windows 10, no Ubuntu for me. It would take too long to learn at my age. Oh and I was able to repair my old Windows 7 myself, and it sits right next to my Windows 10 on my desk back here in Mexico. Well I definitely like my Windows 10 better, spyware and all :) and I use said Windows 10 Microsoft surface book about 90% of the time. Rumor has it that the Seahawks failed to real this article and their tablets didn't work correctly against Carolina. Oh wait a minute, that may have been one of the excuses used by the Patriots? I figure most anything I post on line or say over my land line or over cell phone is subject to someone listening or watching, especially when I post on sites like Facebook which I do. So I try never to do anything using any of the above if I do not want others to know what I said or wrote. It would be nice, though, if Windows 10 would tighten up their security. If someone installs Linux (Ubuntu is only one of many versions) for you, it isn't hard to learn. But, if there is no one close to help if you get stuck, then, yes, it is probably a bad idea. Linux user since 1999 a couple years after I retired. I am very used to Windows 10 and it does everything I need. It is only one of several good solutions. I guess because I have an SSD (solid state drive) my Windows 10 is very fast. I'm a very casual computer user, I've never used a computer for anything but my own personal usage---about 99% email, message boards and shopping. I started on DOS and gave up almost immediately. After a few years without a computer I tried again starting with Windows 95, then a Mac and finally settled on Linux. For a casual user, such as myself, I think that switching between operating systems is not much more complicated than switching between a Ford and a Chevy. Most recently I switched to a Chromebook and added Ubuntu to it. So far it is fast and bulletproof and I can switch between operating systems with one click of the mouse. I have the simplicity of the Chromebook backed up by a full Linux OS for those times when I need more than just a browser. Perfect---and getting better!